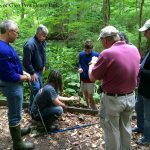 We have monthly nature walks (or volunteer days) in Glen Providence Park, year-round! 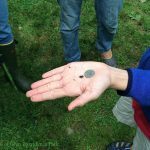 We’ve documented our Spring Cleanups in March and April and our Spring Bird Walk in May – here we recount our other 2016 Nature Walks (and a History Lecture!) 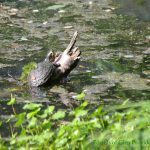 through June, including a photo gallery. Join us for some of our upcoming 2016 events – they are always free and open to the public! 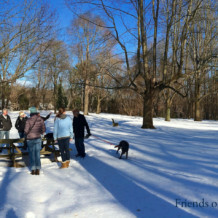 Shannon Davidson and Marcia Tate led us on a beautiful, cold, and fun afternoon tree mapping in the park! 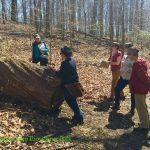 Thirteen volunteers added almost 50 trees by the Kirk Lane entrance to the PhillyTreeMap database, including one new species for our Park Tree List. 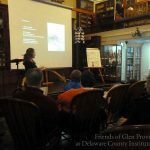 There was a great turnout for February’s history presentation about T. Chalkley Palmer and Scroggie Valley (the park’s 19th century name) at the Delaware County Institute of Science (DCIS) – 81 people attended! 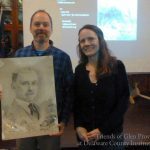 I had fun working with Roger Mitchell and Walt Cressler on this lecture, and sharing some of what we’ve learned about the the history, flora, and fauna of Glen Providence Park – and about its enthusiastic early fan, T. Chalkley Palmer. Just one week after a crazy spring snow(! 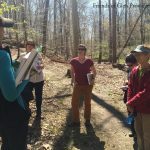 ), we had a spectacular spring day for our Native Plant Walk – with Black Cherry and Redbud trees in bloom, Mayapples and Trout Lilies emerging, and Flowering Dogwood and Silverbell trees getting ready to blossom. 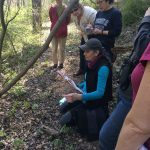 Shannon Davidson and Marcia Tate led us again, sharing their extensive knowledge about so many interesting plants with enthusiastic (note-taking!) attendees! 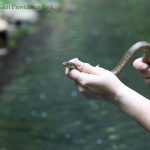 It was another great herpetology walk with Kyle Loucks of the PA Amphibian & Reptile Survey – the third walk Kyle has led for us! 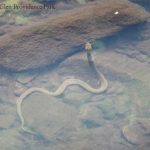 Our early morning attendees found 9 species of reptiles and amphibians, including Dusky Salamander, Northern Watersnake, Pickerel Frog, Green Frog, and Painted Turtle; a tiny American Toad(let); and new for our Park Reptile & Amphibian List, the invasive Yellow-bellied Slider. 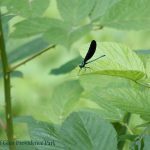 We also saw iridescent Ebony Jewelwing damselflies by the pond, and heard the distinctive rattling call of a Belted Kingfisher throughout morning. 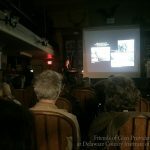 Thank you to everyone who attended these park events, to DCIS for scheduling our history lecture, and to our wonderful volunteer walk leaders! You can see photos in our gallery below – click on any photo for a closer look.